Potsdam is a town located in St. Lawrence County, New York, United States. The town population was 17,029 at the 2010 census. Potsdam is a cultural and educational hub of Northern New York. When SUNY Potsdam and Clarkson University are both in session, the population increases by approximately 8,000 students. The town is named after the city of Potsdam in Germany. The Town of Potsdam also contains a village named Potsdam.The scenic Racquette River bisects the community and provides residents and visitors with panoramic riverine views, convenient recreational access and is a source of renewable energy for the Village's generation of hydro-electric power. Settled in 1802, the Village was recognized as one of the industrial and commercial centers of St. Lawrence County given its hydro power assets, its agricultural and mineral wealth. 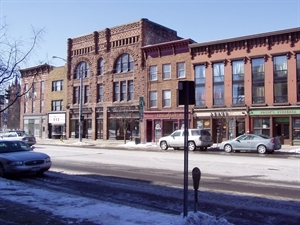 Today the Village is best known as a center for health care, education and retail trade in Northern New York. The village has many local owned dining options including the regions only gluten free cafe/bakery as well as a few known brand named "fast food" chains. Potsdam offers many outdoor recreational and fitness options. There are walking/hiking trails along the Raquette River within Potsdam as well as in nearby communities. The river provides for fishing, canoeing, and in some sections- white water kayaking. Potsdam has a movie theater, bowling alley, and has outdoor festival and concerts during the summer months. Potsdam has a great downtown of unique specialty shops. Potsdam is fortunate to be the home of the Orchestra of Northern NY, the Crane School of Music, Community Performance Series, Potsdam Public Museum, and the St. Lawrence County Arts Council. All of these organizations provide the community with access to a variety of cultural activities from music and theater events to art exhibits/workshops, book clubs, and historical exhibits. Public bus transportation available via a county wide program which has routes between nearby communities. Local taxi services available as well. Canton-Potsdam Hospital is a not-for-profit community healthcare facility certified for 94 beds. Its core programs in emergency medicine, acute care, hospitalist medicine, and critical care are supplemented by outpatient health services in Brasher Falls, Canton, Colton, Massena, Norfolk, Norwood, and Potsdam, NY, and by specialist care in over 25 different specialties, including a robust orthopedic surgery and sports medicine program and the Center for Cancer Care. As an affiliate with Gouverneur Hospital in Gouverneur, NY, CPH operates within the St. Lawrence Health System, a parent corporation formed to give structure and coherence to the coordination of care in Northern New York and to catalyze change in alignment with New York State's Triple Aim: improving health, enhancing quality, and reducing costs. With assistance from the New York State Doctors Across New York Program, and with oversight from Michael Maresca, Chief Medical Officer, CPH has more than doubled the size of its exceptionally talented medical staff to serve the needs of our rural region. Jan 4.5 F° 15.2 F° 25.9 F° 2.3 "
Feb 7.0 F° 17.8 F° 28.7 F° 2.0 "
Mar 18.8 F° 29.0 F° 39.2 F° 2.4 "
Apr 32.2 F° 42.5 F° 52.8 F° 3.0 "
May 44.7 F° 55.7 F° 66.7 F° 3.0 "
Jun 53.6 F° 64.2 F° 74.8 F° 3.4 "
Jul 58.4 F° 69.0 F° 79.5 F° 3.7 "
Aug 56.1 F° 66.7 F° 77.3 F° 4.1 "
Sep 47.5 F° 58.1 F° 68.7 F° 4.2 "
Oct 36.2 F° 46.6 F° 57.0 F° 3.3 "
Nov 27.0 F° 35.5 F° 44.1 F° 3.4 "
Dec 12.6 F° 22.0 F° 31.5 F° 2.7 "
Potsdam is located in the St. Lawrence River Valley between the Adirondack Mountains and the mighty St. Lawrence River that separates this part of New York State from Canada. We are far enough North and away from the Lake Ontario to avoid Lake Effect Snow but do receive measurable amounts of snow from other storms. We do have four seasons though the length and intensity of our Winter can last beyond the month of February. Our comfortable Summers lead into a beautiful autumn with great tree foliage. Condos Over 50 Communities Housing in Potsdam varies from apartment and housing rentals to home ownership in both a more village setting to rural homes. There are senior housing apartment complexes in the village. Mayfield Apartments is a Senior affordable housing community with 1 Bed(s) apartments units. Midtown Apartments has a total of 65 units, all of which are Section 8 assisted living units. All units on this property are one-bedroom. The Village of Potsdam is home to three temporary employment agencies, Penski, Inc. Personnel Services, Kelly Services, and Personé Staffing. These firms can provide temporary employment. There are a variety of Non profit organizations in the community in need of volunteers...from the local humane society, food pantries, Arts council, Community Performance Series, hospital foundation, friends of the library, etc.